Several years prior to the 1967 publication of Derrida’s book, Theodora Kroeber, wife of anthropologist Alfred Kroeber, published Ishi in Two Worlds (1961), “A Biography of the Last Wild Indian of North America,” which explores the degradation of Ishi’s tribe and culture. A few years later, Kroeber issued a partially fictionalized version of Ishi’s story under the title Ishi: Last of His Tribe (1964). 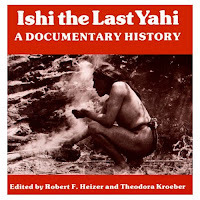 (Recently, in 2003, her sons Karl Kroeber and Clifton Kroeber co-edited a book on the Ishi affair, Ishi in Three Centuries, the first scholarly book on the subject to contain essays by Indians.) There were popular songs about Indians before the publication of Theodora Kroeber’s first book on Ishi in 1961, of course—“Indian Love Call,” “Oklahoma Hills,” and Hank Williams’ “Kaw-Liga”—but beginning in the Sixties, many songs were written celebrating the Indian as an emblem of natural goodness, mightily sinned against. They might be understood as songs expressing remorse, but by engaging in self-accusation and self-humiliation.